If you use the clock positions 1-9 for the single minutes, that leaves clock positions 10-12 unused. Add a position between 10 and 11 and a position between 11 and 12, and you now have five positions from 10-12 for the tens of minutes. So, minutes 0-59 can be read naturally from LCD segments at the normal clock positions plus just two more positions, and the different spacing from 10-12 makes those five positions stand out separately from 1-9 for high legibility. For the hours, add an inner ring of LCD segments at the 12 standard positions. 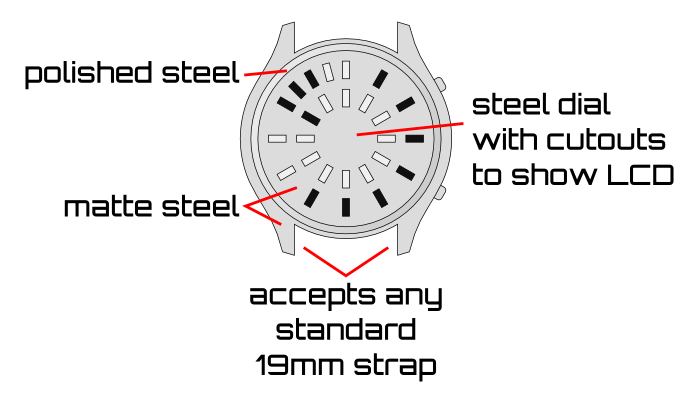 In Space Engine, the LCD segments are revealed through a steel dial with cutouts. For visibility, one LCD state would have a color highly contrasting with the dial, the other state would be a color similar to the dial. 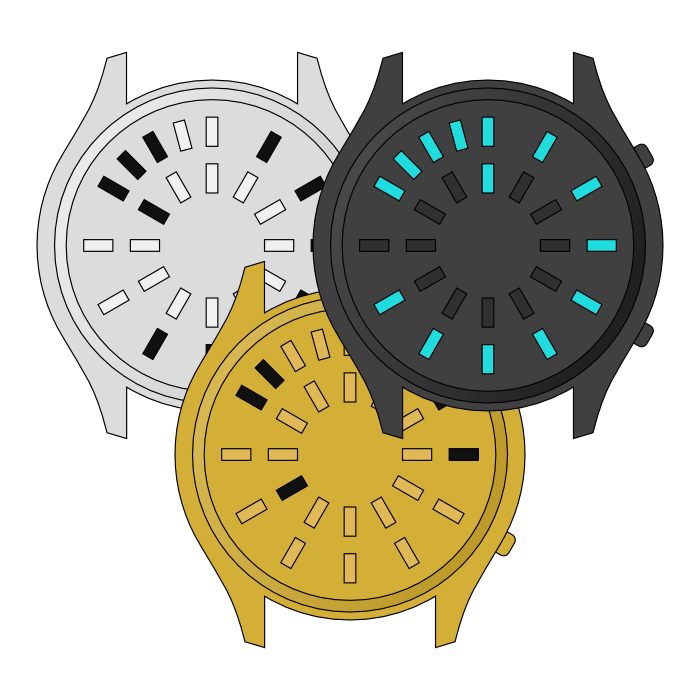 For example, IP black dial with cyan and black LCD. To make this always-on display even easier to read at a glance, the hours are marked by a single LCD segment in the contrasting color state, while the minutes are marked by continuous arcs of all segments from 1 to the number of single minutes or 10 to the number of tens of minutes (or no segments for 0). The display would be backlit by an LED in the center, hidden by the dial, perhaps allowing for more uniform lighting and a thinner bezel than an edge-lit design. 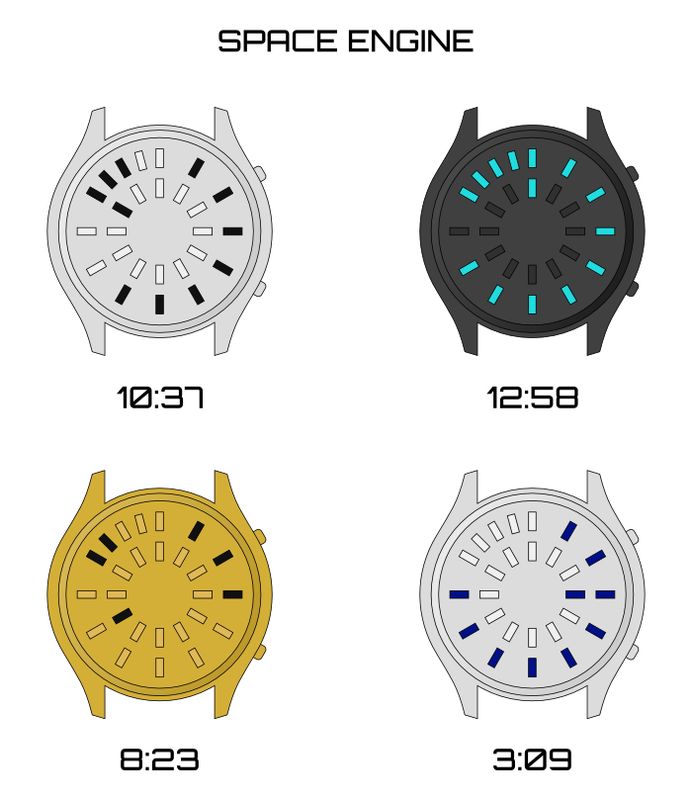 This entry was posted in Design Submissions and tagged 12-5-9, Analog, Concept Watch Design, dots, easy watch, futuristic, LED Watch, sci-fi watch, unisex, Watch Design Submission. Bookmark the permalink. Very nice concept Logan, clean and uncluttered. Also, the presentation appeals to me by its simplicity. Why complicate things needlessly? Having said that, it looks like the layout is clear enough that it’d be possible to play around with the shapes of the cutouts and other styling if you wanted to evoke more ‘space engine-yness’ (yes, I’ve decided that’s a word). Thanks for the feedback, Anders. I like the idea of making the styling a little more complex, and what I had in mind was to vary the surface finish in different parts. Maybe more could be done in that direction, a subtle pattern on the dial, for example.